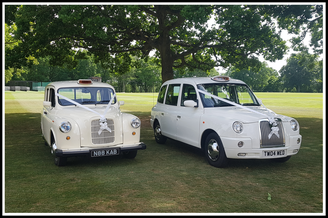 White London Taxis provide unique and affordable wedding cars in Surrey & Sussex. Classic wedding car curves, without the stuffy rules and telephone number prices. To secure each vehicle, just a £55 deposit is required (£100 for a photo booth taxi), with the balance payable 4 weeks prior to the wedding. Once we have received your booking form and issued a receipt for the required deposit, we will reserve your chosen wedding cars for your date. Two or more white wedding cars in Surrey & Sussex. Last minute bookings (weddings 2-4 weeks away). All wedding cars are subject to a minimum hire charge after any discounts of £235. So why the minimum charge? It's a fair question to ask - As well as the time you are actually with the wedding car going from "A to B" (which we accept can be just a mile or two), there are hours of behind the scenes preparation. The minimum hire charge covers time spent administering your booking, cleaning and dressing the vehicles, pre deployment inspections, getting the wedding car to you and then back to base. It also covers the costs of the fuel, correct insurances and the staff/drivers wages. Most importantly, it secures you EXCLUSIVE use of a high quality wedding taxi complete with wedding car service for your special day. This means if your need us a little longer than planned, no problem as we don't have to rush of to another wedding. Can You Do Two Trips? Yes - Provided it's not so far away as to risk that all important bridal journey, we will happily also run bridesmaids or mother of the bride to the venue first. As you have to account for the round trip times, the maximum practical is about a 10 minute or 5 mile drive. Any longer and you risk, your bridesmaids waiting an age at the venue after being dropped off. Just 10 minutes away means the first to arrive waiting 20 minutes for the next person, 15 minutes away and its half an hour! We can also take the role of second wedding car. A special groomsmen or bridesmaids car for when the bride has selected her own alternate wedding car or is staying at the venue. 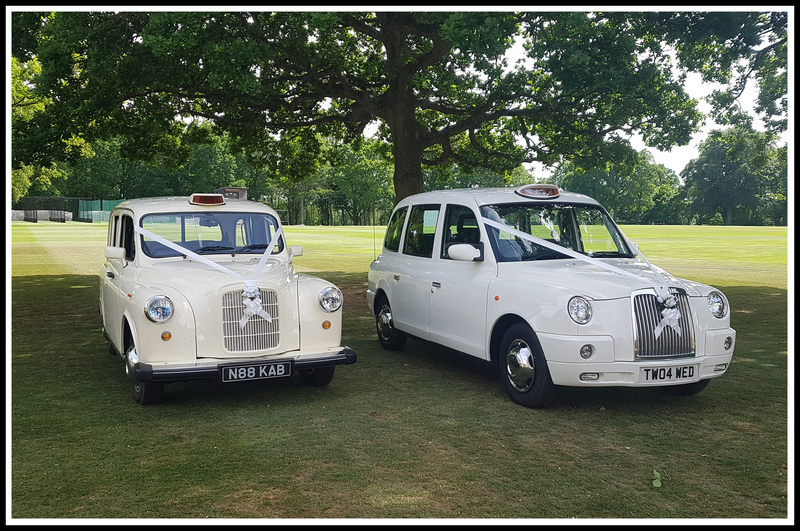 If two trips are just not viable, we can provide multiple vehicles including a pair of restored Classic White London Taxis. £545 - 3 Hours usage for wedding venues Surrey or Sussex. Payments can be made via, cheque, online bill payment/bank transfer or PayPal. White Taxi & Top Model!